I've been making cupcakes every month this year, check out the other ones I've done so far. I've been looking forward to making these cupcakes since the end of December when I got my calendar. When I realized that we would be out of town for our monthly church potluck I had to figure out a time to make these. I even tried to think of ways to get them to church like I did last month, but that just was not going to happen. I ended up just making them for our family to enjoy since everyone ended up getting sick right before the picnic I was going to take these to. Were so cute! I love the spring colors and the chocolate frosting. 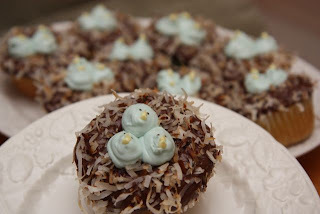 We had fun making these and I had quite a crowd gathered trying to taste help with the frosting. Now if only it was not so hot here the little birdies would have held their shape a bit better. Oh well, they still look cute.